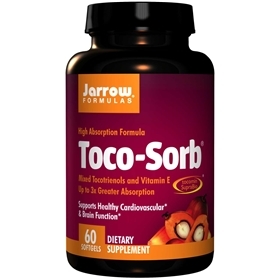 TocoSorb tocotrienol-vitamin E complex utilizes SupraBio enhanced absorption system. Tocotrienols protect cardiovascular function by affecting biosynthesis of cholesterol and reducing oxidation of low density lipoprotein (LDL-Cholesterol). Typically, bioavailability of tocotrienols is low (absolute bioavailability is about 28%). Patented SupraBio specialized lipid mixture enhances tocotrienol uptake 2 to 3 times. Take 1 softgel, 1 or 2 times per day with a meal, or as directed by your qualified health care consultant. Softgel consists of gelatin, glycerin, water and polyoxyl castor oil.